Extra-Tall High Tunnels offer superior ventilation and maximum usable growing space due to their increased sidewall height. Start growing earlier and grow late into the fall with a Extra-Tall High Tunnels! Experience larger, healthier yields due to the maximum usable space! End Frame Kits, Doors, Ridge Vent Kits, Roll-Up Ends and Support Packages are sold separately. 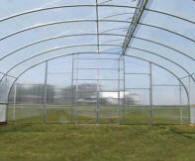 » Covering: 6 mil 4 year Clear Greenhouse Film. Customize your Roll-Form Building to your exact needs. Premium, galvanized steel end frame kits allow you to add strength and durability to your building's ends. The perfect option for adding roll-up doors (sold separately). Suitable for both 20'W, 24'W,30'W and 35'W , 42' buildings. Roll-Up Ends: Roll-Up End options, which use our Hand Crank Assembly feature, are made from 10 oz., 22 mil translucent fabric. 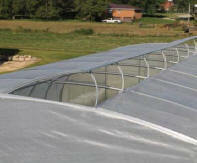 Ridge Vent Kits: Innovative Ridge Vent Kits will increase ventilation inside your growing structure. They are easy to use and are operated manually. One Ridge Vent Adapter Kit should be purchased for every 12' of length of your structure. Zippered Clear Roll-Up Door: Customize your Roll-Form Building to your exact needs with our Fabric End Panels. » End panels are manufactured from our premium 10 oz, 22 mil clear, UV-resistant polyethylene. » Choose either solid or zippered ends. 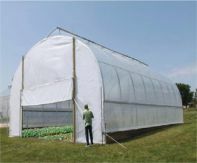 Customize your Curtain-High Tunnel to suit your exact needs.